^ 1.00 1.01 1.02 1.03 1.04 1.05 1.06 1.07 1.08 1.09 1.10 1.11 1.12 Feynman, Richard. QED: The Strange Theory of Light and Matter. Princeton University Press. 1985. ISBN 978-0-691-12575-6. ^ P.A.M. Dirac. The Quantum Theory of the Emission and Absorption of Radiation. Proceedings of the Royal Society of London A. 1927, 114 (767): 243–265. Bibcode:1927RSPSA.114..243D. doi:10.1098/rspa.1927.0039. ^ E. Fermi. Quantum Theory of Radiation. Reviews of Modern Physics. 1932, 4: 87–132. Bibcode:1932RvMP....4...87F. doi:10.1103/RevModPhys.4.87. ^ F. Bloch; A. Nordsieck. Note on the Radiation Field of the Electron. Physical Review. 1937, 52 (2): 54–59. Bibcode:1937PhRv...52...54B. doi:10.1103/PhysRev.52.54. ^ V. F. Weisskopf. On the Self-Energy and the Electromagnetic Field of the Electron. Physical Review. 1939, 56: 72–85. Bibcode:1939PhRv...56...72W. doi:10.1103/PhysRev.56.72. ^ R. Oppenheimer. Note on the Theory of the Interaction of Field and Matter. Physical Review. 1930, 35 (5): 461–477. Bibcode:1930PhRv...35..461O. doi:10.1103/PhysRev.35.461. ^ W. E. Lamb; R. C. Retherford. Fine Structure of the Hydrogen Atom by a Microwave Method,. Physical Review. 1947, 72 (3): 241–243. Bibcode:1947PhRv...72..241L. doi:10.1103/PhysRev.72.241. ^ P. Kusch; H. M. Foley. On the Intrinsic Moment of the Electron. Physical Review. 1948, 73 (3): 412. Bibcode:1948PhRv...73..412F. doi:10.1103/PhysRev.73.412. ^ H. Bethe. The Electromagnetic Shift of Energy Levels. Physical Review. 1947, 72 (4): 339–341. Bibcode:1947PhRv...72..339B. doi:10.1103/PhysRev.72.339. ^ S. Tomonaga. On a Relativistically Invariant Formulation of the Quantum Theory of Wave Fields. Progress of Theoretical Physics. 1946, 1 (2): 27–42. doi:10.1143/PTP.1.27. ^ J. Schwinger. On Quantum-Electrodynamics and the Magnetic Moment of the Electron. Physical Review. 1948, 73 (4): 416–417. Bibcode:1948PhRv...73..416S. doi:10.1103/PhysRev.73.416. ^ J. Schwinger. Quantum Electrodynamics. I. A Covariant Formulation. Physical Review. 1948, 74 (10): 1439–1461. Bibcode:1948PhRv...74.1439S. doi:10.1103/PhysRev.74.1439. ^ R. P. Feynman. Space–Time Approach to Quantum Electrodynamics. Physical Review. 1949, 76 (6): 769–789. Bibcode:1949PhRv...76..769F. doi:10.1103/PhysRev.76.769. ^ R. P. Feynman. The Theory of Positrons. Physical Review. 1949, 76 (6): 749–759. Bibcode:1949PhRv...76..749F. doi:10.1103/PhysRev.76.749. ^ R. P. Feynman. 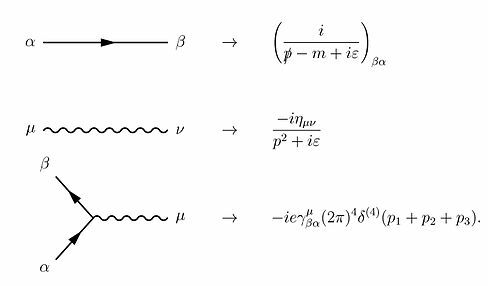 Mathematical Formulation of the Quantum Theory of Electromagnetic Interaction. Physical Review. 1950, 80 (3): 440–457. Bibcode:1950PhRv...80..440F. doi:10.1103/PhysRev.80.440. ^ 16.0 16.1 F. Dyson. The Radiation Theories of Tomonaga, Schwinger, and Feynman. Physical Review. 1949, 75 (3): 486–502. Bibcode:1949PhRv...75..486D. doi:10.1103/PhysRev.75.486. ^ F. Dyson. The S Matrix in Quantum Electrodynamics. Physical Review. 1949, 75 (11): 1736–1755. Bibcode:1949PhRv...75.1736D. doi:10.1103/PhysRev.75.1736. ^ G.S. Guralnik, C.R. Hagen, T.W.B. Kibble. Global Conservation Laws and Massless Particles. Physical Review Letters. 1964, 13 (20): 585–587. Bibcode:1964PhRvL..13..585G. doi:10.1103/PhysRevLett.13.585. ^ G.S. Guralnik. The History of the Guralnik, Hagen and Kibble development of the Theory of Spontaneous Symmetry Breaking and Gauge Particles. International Journal of Modern Physics A. 2009, 24 (14): 2601–2627. Bibcode:2009IJMPA..24.2601G. arXiv:0907.3466. doi:10.1142/S0217751X09045431. ^ 22.0 22.1 22.2 22.3 22.4 22.5 22.6 22.7 22.8 22.9 Peskin, Michael; Schroeder, Daniel. An introduction to quantum field theory Reprint. Westview Press. 1995. ISBN 978-0201503975. ^ Schwarz, Matthew D. Quantum Field Theory and Standard Model. Cambridge University Press. 2014. ISBN 978-1-107-034730. ^ Kinoshita, Toichiro. Quantum Electrodynamics has Zero Radius of Convergence Summarized from Toichiro Kinoshita. [2010-06-10]. De Broglie, Louis. Recherches sur la theorie des quanta [Research on quantum theory]. France: Wiley-Interscience. 1925. Feynman, Richard Phillips. Quantum Electrodynamics New. Westview Press. 1998. ISBN 978-0-201-36075-2. Jauch, J.M. ; Rohrlich, F. The Theory of Photons and Electrons. Springer-Verlag. 1980. ISBN 978-0-387-07295-1. Greiner, Walter; Bromley, D.A. ; Müller, Berndt. Gauge Theory of Weak Interactions. Springer. 2000. ISBN 978-3-540-67672-0. Kane, Gordon, L. Modern Elementary Particle Physics. Westview Press. 1993. ISBN 978-0-201-62460-1. Miller, Arthur I. Early Quantum Electrodynamics: A Sourcebook. Cambridge University Press. 1995. ISBN 978-0-521-56891-3. Schweber, Silvan S. QED and the Men Who Made It. Princeton University Press. 1994. ISBN 978-0-691-03327-3. Schwinger, Julian. Selected Papers on Quantum Electrodynamics. Dover Publications. 1958. ISBN 978-0-486-60444-2. Tannoudji-Cohen, Claude; Dupont-Roc, Jacques; Grynberg, Gilbert. Photons and Atoms: Introduction to Quantum Electrodynamics. Wiley-Interscience. 1997. ISBN 978-0-471-18433-1. Dudley, J.M. ; Kwan, A.M. Richard Feynman's popular lectures on quantum electrodynamics: The 1979 Robb Lectures at Auckland University. American Journal of Physics. 1996, 64 (6): 694–698. Bibcode:1996AmJPh..64..694D. doi:10.1119/1.18234.